Sent in the post to me from ReetPetit as a RABCK, Thanks! I really enjoyed this book, full of fab suggestions to make the world a nicer and sunnier place! Some really good stories of RACKs to inspire and delight you! "Pick up some teas and biscuits for the people you work with"
I will organise a ray for this book in a few weeks' time, and the last bookcrosser can release it into the wild or hand it to a stranger on the street! :-) This is a bookray, so the last person on the list can keep the book / wild release it / RABCK it / do another ring or ray / the choice is yours!! Received today.I`m looking forward to get some good ideas! I liked very much the whole idea of the book. It is amazing how little it takes sometime to make your life more helpful to others.Some of my favorites are: "Say something nice about someone behing their back", "Forgive someone","If you like someone,make sure they know","Take your glass back to the bar" and etc. It is worth giving a bit of thought how to bring more joy in our lives and the lives of people around us. Shall be mailing it to jennee when I receive her address. I forgot to journal that I sent the book to Jennee. I got the book today in the mail, thank you Milena! I already read half on the bus home, I love the whole idea of this... I also feel pretty good about myself because I already did some of the suggested things :D I'll finish it now (already made myself that cup of tea...), then I'll PM Alvhyttan and send it whenever I get the address. Edit: mailed to Alvhyttan a couple of days ago. Got it in my mail today. Looks like a lovely and fun little book. Love the card with attached teabag! I´m going to make myself a nice cup of tea and read. And this little book have a lot of suggestions on kind things to do, some I do automatically and some I havn´t thought about before I read this book. A great idé of the author to start this "Karma Army"! Hope it will help to change the world! Thank´s for sharing this book! I will send it to janiemac75 today. I received this book today Alvhyttan thank you. I have a couple of bookrings to read first, but I should be able to read it during the Christmas Holidays. Came with the post this morning. Looks like it shouldn't take long to read, but I'm just over halfway through The Time Traveler's Wife, which is a thick book. It is a bookring book, too, so I'd better finish it first. It has been nice browsing in the book, and I'm looking forward to the nice cup of tea I'll have later, courtesy of janiemac, and reading the book properly. Thank you to ReetPetit, nice-cup-of-tea and janiemac75! I have the next address and hope to get it in the mail today. -wish an astronaut good luck at An Astronaut, NASA Headquarters, 300 E St SW, Washington, D.C.
Wow, there were more there than I thought! Received today and I can't wait to get the kettle on, settle down and be inspired. Edited to add. Sorry folks for holding this up; it's on the way down the list now. Arrived today - thanks for passing around everyone. It looks like a dip in and out book so I shall when my son has his first nap of the day! Loved the little book and its top tips for making the world a better place! Have written down my fav on 43things.com and will keep a trasck there of how I do! Addressed and ready to be posted to the next do-gooder! Positive little book, I'm all for spreading a little sunshine but quite a lot of the RAOKs were very very similar. Could have done with a little more editing but I guess if it inspires people, then job done. Thanks for the hot choc btw, has been snaffled by my husband. On it's way to Purplerose73 ASAP. Thoroughly enjoyable, great little acts of kindess that could make somebodies day, PMing KarenZero now for next address. Book arrived safely. Will read ASAP. Thanks! This was a cute little book! I also have read Are You Dave Gorman? and now I need to read "Join Me" so I can see how this idea started! - giving away books - hooray for bookcrossing! Thanks for sharing the book ReetPetite & NiceCupofTea! Sent on to the next reader! Book arrived safely...thanks! I'm in the middle of another book at the moment, and have a jam-packed week ahead, but I hope to get this one started by the weekend. Looks like some great little tips for spreading the good karma onto others...Can't wait to read it! I've PM'd snowy652 for her mailing info, and hope to have this moving along w/i the next few days. Winging it's way over the falls and into Canada. arrived in todays mail. This looks like a delightful read. I will comment on it once I have read it and then pass it on to the next reader. Thanks for letting me be part of this ray. Thank you also to dg7500 for the rabck wishlist surprise book that you sent -- blessings your way!!! ****A quick feel good read. This was an enlightening little book that caused my heart to be happy. Thank you for the opportunity to read this one. Received as part of a book ray. Thanks for the tea, snowy652! A fun book, though I couldn't help thinking that a few of the ideas could get one arrested! Give a deck of cards to a stranger. Buy something for the person behind you in the drive-thru. Leave bottled water at the gym. Write a postcard to the postman. Buy a snack at a vending machine and leave it there. Buy phone cards for international students. Enclose a stamp in a letter. Anyway, sent this along to the next reader yesterday. Enjoy! This arrived safe and sound today. Along with some yummy hot chocolate. I love hazelnut! This book will be a quick read. Thank you. Certainly some nice ideas in this book. I'm happy to see I already do a few of them. :) This will on its way next week. Thank you for sharing! Received this a few days ago. It has made me so happy! I'm looking forward to trying out some of the ideas and am trying to think of a few of my own! What an adorable book and wonderful ideas! Some of them had me laughing out loud in public. What a happier world this would be if everyone practiced random acts of kindness! hshah is currently traveling and asked to be skipped. Catsalive and charliewendy also wish to be skipped. I have PMd the next person in line. Mailed to lmn60 on 10/27/06. Arrived safely in my letter box yesterday afternoon. I have a couple of rings ahead of it, but this one looks such a slim volume that I'm sure I'll be able to read and pass it on in a timely fashion! More when I've read this fun looking book! A lovely little book - full of great ideas (some of which I was happy to note I've already done!). 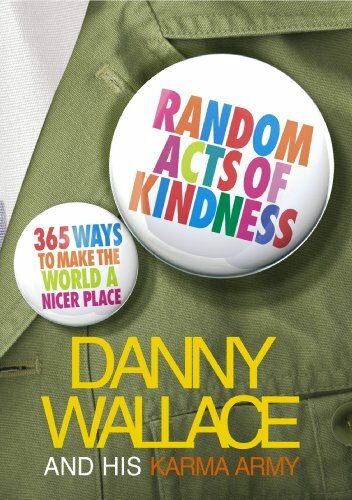 I'm now quite intrigued by Danny Wallace and want to find out more about him and the Karma Army. Thanks for sharing this one with me (and many others) nice-cup-of-tea, in a not-so random act of kindness. I've PMed Calissa for her address and will send it on soon. It never rains, it pours, especially when it comes to bookrings. Which is to say, it arrived safely and will be read after I finish my current book. A huge thank you to nice-cup-of-tea and especially so for putting me last. If nothing else comes up, I might save this to give away at the Australian Bookcrossing Convention in October. We'll see. Well that was a quick read! And a very lovely one too, on a day when I'm not quite feeling myself. Posted off to libertine101 today, who has this book on her wishlist. Wow...I had NO idea this book had such a history of travel! I was a wee bit cynical about some of the ideas though...esp the food related ones that involved giving food that was not in sealed packages. I guess I'm just paranoid. Is it a sign of the times? Apart from that, some nice ideas here.